Marijuana is the most commonly used illicit drug in the United States. An estimated 22.2 million people have used marijuana over the last 30 days.1 While many people consider this drug to be harmless, research shows that marijuana use may reduce thinking, memory, and learning functions and even affect how the brain builds connections.2 For these reasons, as well other issues that affect the life of the marijuana user and his family, it is important to recognize the signs of marijuana use and then to find help. Loss of focus during a conversation. An individual who is high on marijuana finds it difficult to hold a normal conversation. The individual will lack the ability to stay focused on the topic of conversation. He may drift into other, unrelated subject matters. Increased appetite. One of the effects of marijuana use is binge eating. After smoking pot, the individual will want to eat large amounts of junk food and sweets. Lack of energy and loss of motivation. Marijuana users have a distinct lack of motivation. Look for a loss of interest in activities that were once a significant part of the individual’s life. Also, the marijuana user may sleep excessively until late in the day. Bad sleep habits are another common sign of marijuana use. Possession of drug paraphernalia. Look for materials such as bongs, rolling papers, roach clips, pipes or other items used to smoke or store marijuana. Inappropriate laughter. When an individual is intoxicated from smoking marijuana, they will sometimes laugh uncontrollably, even at inappropriate moments. Legal or financial problems. Drug users have a constant need for money and have legal problems. Both are warning signs of marijuana use as the individual spends most of his money to finance his drug habit. Legal troubles are another warning sign as the individual transports the illegal substance from place to place. If someone in your life exhibits any of these behaviors, it is important that provide help and support. 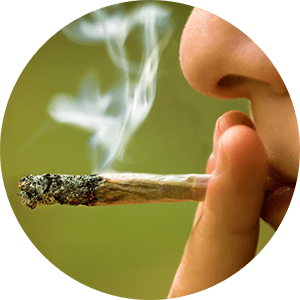 Marijuana addiction has the power to drain the life out of an individual. One thing you can do to help the person you love is to encourage him to admit he has a problem. Then speak with one of our caring team members at Michael’s House. We work with individuals addicted to marijuana every day. Our ground-breaking programs at Michael’s House treat the entire individual, helping change behaviors so that he no longer need marijuana in his life. When he leaves treatment, he will have the skills to live a productive drug-free life. For the finest in residential marijuana rehab treatment, please call Michael’s House today at 760-548-4032. 1“What is the scope of marijuana use in the United States?” National Institute on Drug Abuse. N.p., Apr. 2017. Web. 25 July 2017. 2 “Marijuana.” National Institute on Drug Abuse. N.p., Feb. 2017. Web. 25 July 2017.